I would like to build one of the cheese presses. I have not found anyone that sells compression springs. Where did you buy the springs and did it have a part number. I was wondering where you find the springs. I went to several home improvement and tractor stores and have not found any springs? I got my springs from a local hardware store. The big box stores have an abysmal selection but often the smaller stores will have a bunch of drawers with different sizes of springs. Try an Ace franchise. They seem pretty good. My springs are about 3.25″ long and 1″ dia. You could try an online source like McMaster Carr too. Let me know if you need anything else. Post a picture in the comments when you get your press built. I’d love to see it! Oh I love this!!!! would you be able to post your cheese recipe? or tell me how many quarts of milk you use? would it be around 3 or 6? I have a recipe that is for a #10 mold (7″h x 6 1/4″ W) would this fit into your 5″ w mold? Your a genius btw! LOVE your ideas!!! I use recipes from Ricki Carroll’s book Home Cheese Making which is a great resource for starting cheesemakers. The recipe that I tried was Queso Fresco which uses 2 gallons of milk. Check out her site. She posts all sorts of recipes and has all the supplies you need. You can use any mold you want with the press as long as it fits between the posts you’re good to go. Or build it with your mold in mind. The main thing is that the springs are calibrated with some sort of scale so that you can get reproducible results. Send a picture if you make a press I’d love to see it. Let me know if you have any problems building it and I’ll see what I can do to help sort things out. I haven’t found the spring pressure to be an issue but thanks for the link to an alternative design. Hi there, I am so impressed by your homemade cheese press and the instructions to make it, how clever using the the scales the manner done to measure genius. 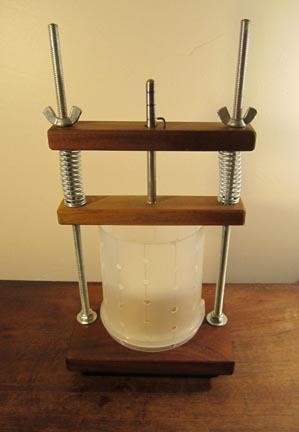 I am going to make a cheese press using your design, it is brilliant, I am new to cheese making and a lot of things are expensive to buy but diy is really the only way to go about acquiring some of the equipment, I just purchased an external thermometer and humidity controller unit for my old bar fridge to mature my homemade cheeses. Thank you for sharing information it is so helpful. I’m glad to hear that you are going to build the cheese press. Post a picture of your build over at Instructables.com if you like.